Occupy Wall Street FAQ – Direct Action Welfare Group Inc. Occupy Wall Street is a series of demonstrations that began on Sept. 17 in Zuccotti Park in New York City. It calls itself a “leaderless resistance movement” with a broad range of participants, mainly protesting economic inequality, Wall Street greed and the influence of corporate money on government. Occupy movement demonstrations have spread across the country, in big cities and small towns. The protest was originally called for by the Canadian activist group Adbusters. Some compare it to the Arab Spring movement. How Is the Labor Movement Involved? Because issues raised by Occupy Wall Street match the labor movement’s priority that Wall Street and the wealthy should pay their fair share to create good jobs, many unions, state federations and labor councils, as well as the AFL-CIO, have issued statements of support. 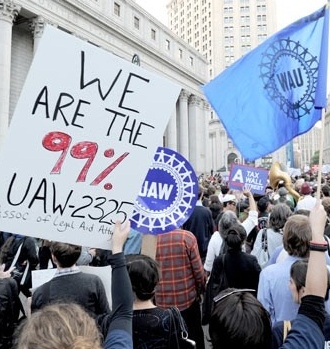 Many labor organizations and their members are participating in Occupy demonstrations as part of the AFL-CIO’s America Wants to Work campaign for good jobs. Some local unions are offering space and in-kind assistance for local Occupy actions, but the labor movement is not an organizer and does not have any formal role in the events. Find a list of union organizations supporting Occupy Wall Street at www.occupywallst-unions.org/ . How Does Occupy Wall Street Work? In New York and other locations that follow the same model, decisions are made collectively by a general assembly—open to all—that meets twice a day. Because sound systems are limited, information is relayed by a “Human Megaphone”—the crowd repeats what is said by each speaker so all in the group can hear. “Yes” votes are signaled by people holding up their hands and wiggling their fingers. “No” votes are cast by people crossing their arms across their chests. Necessary work is conducted by volunteer work groups. Occupy Wall Street in New York has a kitchen, a media station, a sanitation operation and medical, legal and security stations, for example. Show up. Occupy events are open to all, and the bigger the crowds the more we make our voices heard demanding economic justice. If your organization wishes to lend support, issue a statement and speak with a moderator or spokesperson at an Occupy location and ask what is needed there. Remember, these are not “our” events. We don’t try to impose our agenda or ideas on them. But since the Occupy movement began, thousands of union members have taken part. You can find a good list of local Occupy locations at DailyKos (http://www.dailykos.com/story/2011/10/04/1022722/-Occupy-Wall-Street:-List-and-map-of-over-200-US-solidarity-events-and-Facebook%C2%A0pages?detail=hide). While the mainstream media are now covering the Occupy demonstrations, probably the best information sources are websites and social media. Here are some places to start. The unofficial website for the New York occupation is at http://occupywallst.org/. The site carries a live webstream. See a photostream at http://www.flickr.com/photos/occupywallstreet . On Facebook, check out http://www.facebook.com/OccupyTogether and http://www.facebook.com/OccupyWallSt . On Twitter, follow #OccupyTogether, #OccupyWallStreet and #OWS . Be sure to check for websites, Facebook pages and Twitter feeds from your local Occupy sites.